The dough boy has come out with three gluten-free products: chocolate chip cookie dough, pizza crust and pie crust. I decided to try the cookie dough over the weekend. The tub, found in your grocer’s refrigerated case, cost around $4.50 and will make approximately two dozen very small cookies. The instructions on the tub tell you to scoop the dough by the tablespoon onto a cookie sheet. After baking, this is what you get – tiny bite size morsels of yumminess. 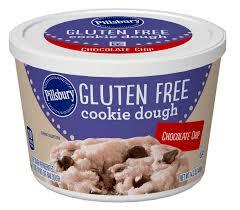 If you were a fan of the pillsbury cookie dough prior to going gluten-free then you should enjoy this product. The taste and texture are very similiar if memory serves me. After doing some research it would appear that Pillsbury does not make these products in a gluten-free dedicated facility; therefore if you have been diagnosed with celiac disease these cookies may have trace amounts of gluten in them. For those that have gluten insensitivity these cookies might just hit the spot. My co-workers were so kind as to bring back a gluten-free cookie for me try today. This was one big cookie. It was about 3 inches wide and about an inch thick. 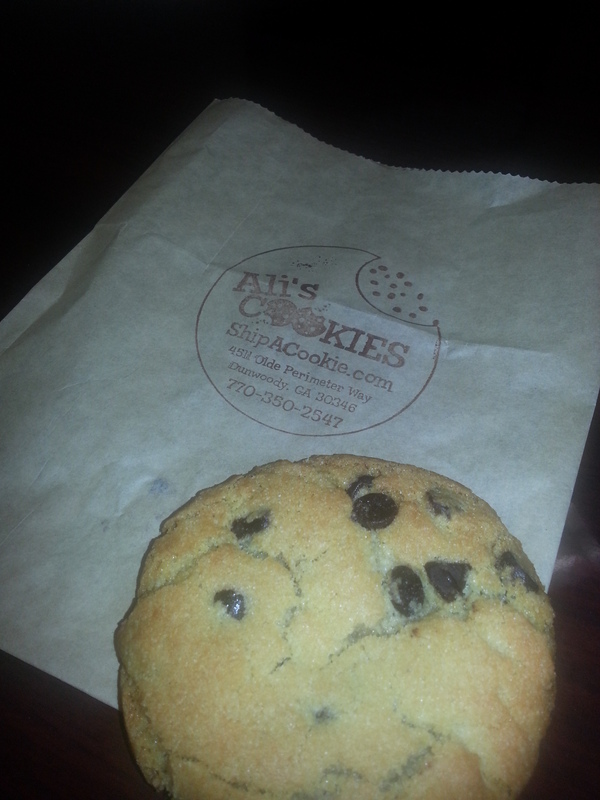 This cookie was moist and filled with great chocolate chip flavor. It reminded me of the gluten filled cookies I used to enjoy. I could certainly taste that this cookie was fresh and it was filled with semi-sweet chocolate goodness. 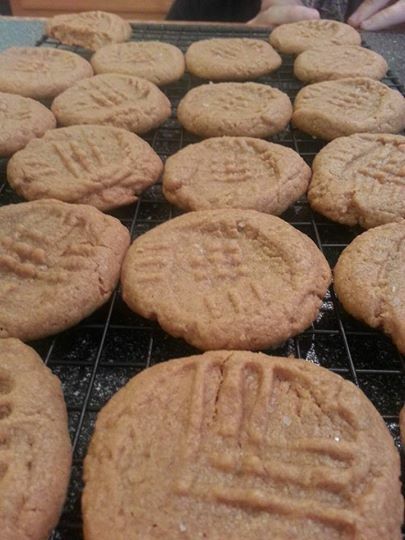 Upon visiting Ali’s website I noticed that some of her cookies were featured on Rachel Ray. 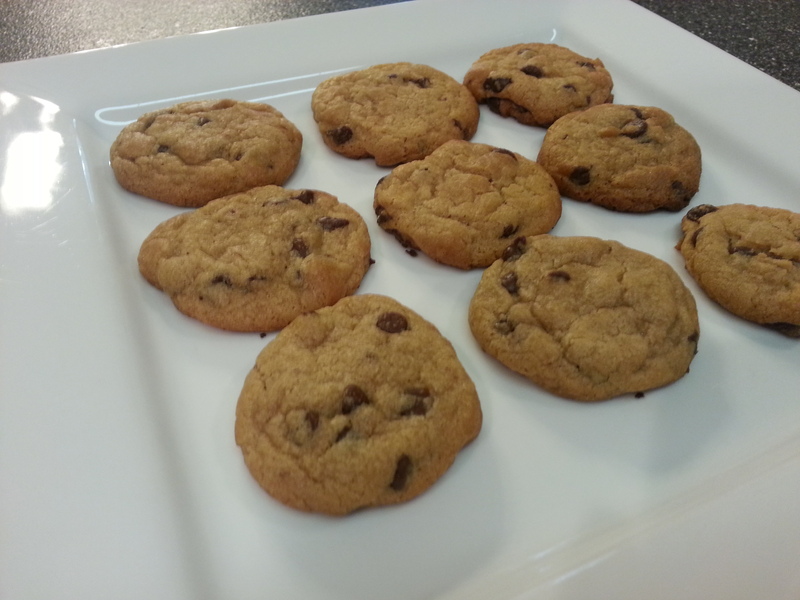 Not all Ali’s cookies are gluten free, but she does ship one dozen chocolate chip cookies or a 12″ gluten free cookie cake that can serve 12-14 people. If you get a chance check out her site SHIPACOOKIE.COM. It will be well worth your time. Treat your kids to something spooky for dinner…….a monster burger! I saw this in a magazine and just had to try it. My kids had a great time gobbling up their monster burgers. It was fun to watch them create their own monster masterpiece. To assemble top hamburger patty with your favorite condiments, ham slice folded like a tongue, cheese slices and then tomato. 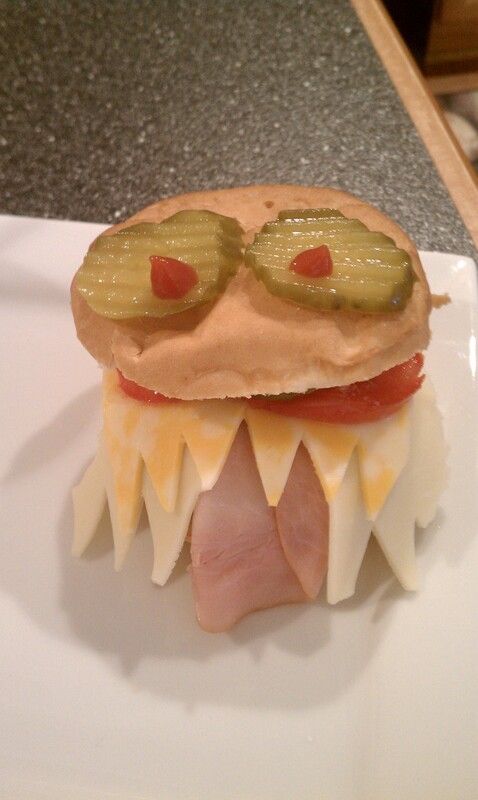 Top with bun and then add your pickle eyes. Feel free to get creative with this. Maybe an olive nose toothpicked on the bun or some shredded lettuce on top for hair. Go for it! Okay….so I’ve been away on vacation, but now I’m getting back into the swing of things. I enjoyed lots of sand, sun and family time while away. It is great to unplug and just be with those you love once in a while. 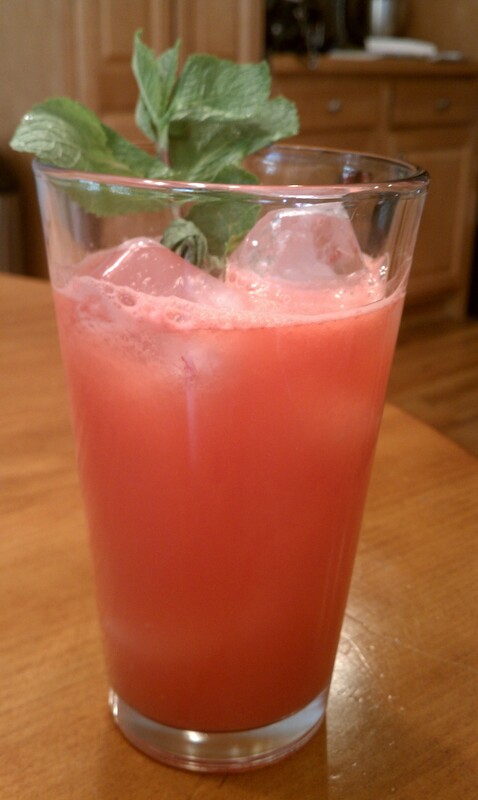 With 4th of July fast approaching I wanted to pass along this awsome drink recipe I found in Rachel Ray’s magazine. This drink is fruity, refreshing and filled with summer flavors. I made it this weekend and I thought it was fantastic. One of my friends told me they think watermelon is God’s perfect fruit and I think they might be on to something. Puree watermelon in a blender and strain in a bowl usine a fine mesh sieve. Stir in honey and lime juice. Transfer to a pitcher and add 1c water, lime slices and mint. Chill and serve over ice. 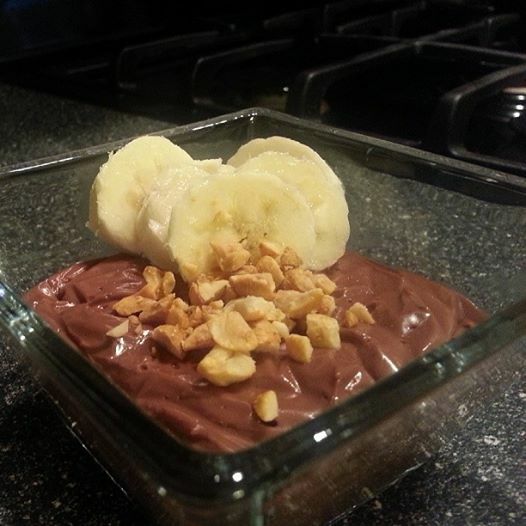 Makes about 6 servings. Bring 1 quart stock plus 1 cup water to a simmer in a sauce pot then reduce heat to low. Heat a medium skillet over medium to medium-high heat with olive oil. When oil ripples, add the onions and garlic and soften 2 to 3 minutes. Add rice and toast 2 to 3 minutes more. Add wine and cook it out completely, stirring occasionally, 2 to 3 minutes. Ladle in stock in intervals, a couple of ladles at a time. Allow liquids to evaporate each time. 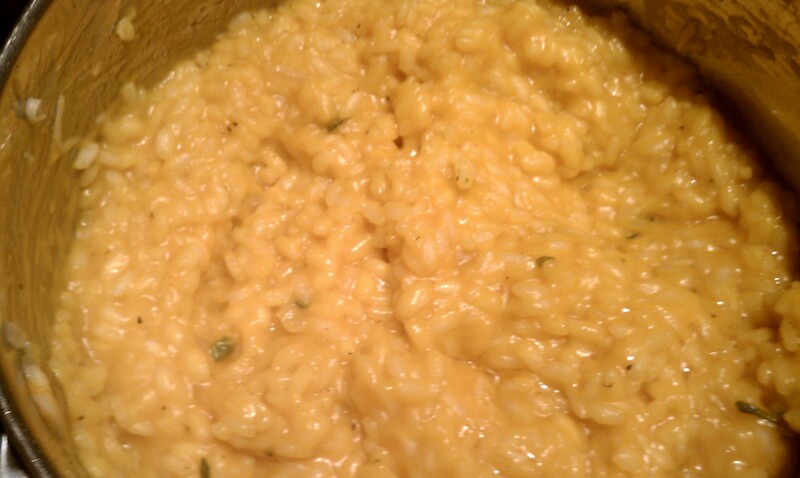 Risotto will cook 18 minutes, total, from the first addition of liquid. Defrost the squash in your microwave in a dish to collect any liquids and stir in squash the last 3 minutes of cook time, season with nutmeg, salt and pepper to taste. In the last minute of cooking time, stir in butter in small pieces, sage leaves and cheese.